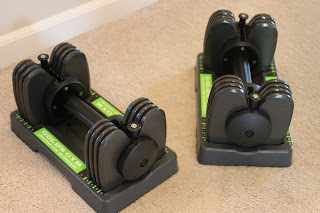 We were able to purchase these weights (from Walmart!) and they go up to 25 lbs. But the beauty is that you can do sizes you normally can’t buy like 7 1/2 lbs, 12 1/2 lbs, etc. This is great for doing exercises that are too difficult to increase by 5 lbs but too easy at the weight you’re at. Since I had a baby 5 weeks ago, I can now start lifting heavier weights again. Remember that lifting heavy weights with less reps builds muscle and makes your metabolism faster and your body tight and toned. Pre-pregnancy body here I come!